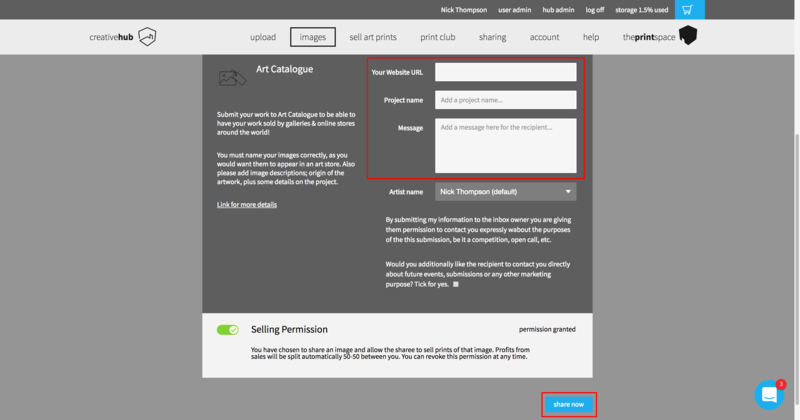 How to set up your images to submit to Art Catalogue in 10 easy steps. The Art Catalogue is a platform for artists and photographers to connect and share work they would like to sell, or find other artist’s work to sell from their online stores. The catalogue contains thousands of artists, photographers and illustrators showcasing their artwork to a large number of online stores and galleries who can choose to sell this artwork for a 50/50 share of the profit, with us handling fulfilment at no commission. 1. Upload an image to get started. Sign up / log in to your creativehub account and upload the images that you want to share. creativehub is a multifunction web application which allows artists to upload, store, print and sell fine art images. It also permits users to swap prints, share their work to a catalogue of sellers looking for new artwork for their stores, and, the ability to enter awards and competitions run by industry leading organisations. 3. Click on print sales pricing on the toolbar (bottom of screen). 4. Choose your print sizes, prices and limited editions. Click + print size and fill in size, price, border & limited edition details. Also select print & paper type. This page allows you to view the production costs as well as profit so you can be sure of your returns. 5. Add image names and descriptions. Click (i) just below the image. Add an image description and ensure the image name is correct. When stores start to sell your work on your behalf, the Shopify app automatically imports all the image titles and descriptions for your images into their product listings and so will be seen by customers. Select the image(s) again and click share images on the toolbar, then click art catalogue from suggested shares. Add a project title, message and website URL and click the share button. Your images are awaiting moderation. We will email you when this is done. Each image submitted to the Art Catalogue goes through two stages of judging before a final decision is made by an external panel of high volume art sales specialists. We aim to make a decision within 7 days of submission although this can sometimes take slightly longer depending on the current rate of submissions. 9. a) Accepted! Add a Paypal account email so we can pay you for sales. Navigate to sell art prints > syndicated art sales. Click how to pay me in the side menu. 9. b) Images declined. Repeat the process with some new images (back to stage 2). 10. Finished! If accepted, we will email store details of who is selling your prints and if you make any sales. When you make a sale through Art Catalogue the production costs are deducted from the total sale amount and the remaining profit is split 50/50 between the artist and vendor. The UK's premiere fine art printing company, theprintspace, take care of production and shipping of the print and the store handles customer service. As the artist, there is nothing you need to do in terms of the sale process. You will receive payment for your 50% of the profits at the end of the following calendar month to the sale in the form of a remittance note. This will be paid via PayPal.